Not every hobby gets its own national holiday, especially one in the seductive days of Spring. If there’s a “Souvenir Spoon Collectors Day” sweeping the nation each year, we haven’t heard of it. But vinyl junkies and music lovers have grown accustomed, in the manner of youngsters and Christmas, to the arrival of Record Store Day every April. For a dozen years now, fans have lined up before the sun rises to invest (yes, that’s the word) in their passion. In that spirit, we’ve compiled a list of some of the year’s most intriguing RSD special releases you might want to look out for tomorrow. Farther down, check out a list of the Nashville record retailers joining 1,400 other outlets nationwide in RSD throwdowns with live music, uninhibited shopping and no small amount of geeking out over favorite artists and recordings. Following the March release of Steve Earle & The Dukes’ album of Guy Clark covers, aptly titled GUY, Earle got back in the studio to record two more solo versions of Clark’s gems exclusively for Record Store Day. Recorded at the Ryman Auditorium last September, Alive in Tennessee is Anderson East’s first concert album, and there was no shortage of raves for his R&B heavy set. East will also be performing at Grimey’s record store in East Nashville as part of its Record Store Day event. There’s usually something waiting for Dead Heads on Record Store Day. This year the band’s exclusive releases include Sage & Spirit, a collection of summer jams to pair with Dogfish Head’s Dead-themed American Beauty Pale Ale—and The Warfield, San Francisco, CA 10/9/80 & 10/10/80,’ two nights of acoustic bliss from the Dead’s 15th anniversary tour. It goes without saying that Robert Johnson was one of the most important blues musicians that ever lived. With his recorded work he influenced generations of guitarists and singer/songwriters. This year Traffic Entertainment is releasing two of Johnson’s singles, “Kind Hearted Woman Blues” and “Terraplane Blues” on a 78 RPM vinyl, for those looking to capture the experience of listening to Johnson’s slide guitar a bit as it felt in his time. Guthrie’s 1952 home demo appears on vinyl for the first time with this 10” release, along with a B-side reworking of the track with accompaniment from Wilco front man, Jeff Tweedy. Also included are two versions of “Beech Haven Ain’t My Home” (a.k.a. “Old Man Trump,” with lyrics written when Fred Trump was his landlord.) One version is performed by Ryan Harvey featuring Ani DiFranco and Tom Morello, and the other by U.S. Elevator. Third Man Records is releasing a remastered compilation of the Texas blues prophet Lightnin’ Hopkins’ singles from 1958. With a new cover from contemporary folk artist Tim Kerr, this reimagined Hopkins record would look great and sound great in any blues collection. Jeff Tweedy’s been a busy man. Last year Tweedy reached into both the literary and music worlds, releasing his memoir Lets Go (So We Can Get Back) in close conjunction with an album of solo-written tracks, WARM. The intimate album gave glimpses into Tweedy’s personal perspective and showed his continued strength as a songwriter outside of Wilco. This year, he’s releasing an LP of previously unreleased tracks from the WARM sessions—a nice addendum for any Tweedy fanatic. Limited to only 450 copies, “Cold War Countdown” is a strange collection of ultra-nationalist anthems coming out of the mid-century threat of communism that gripped the nation from the ‘50s through the ‘70s. Included are rare singles such as “I’m No Communist” by Grandpa Jones and “The Bay of Pigs” by Red River Dave. Those who can manage to snag this release will be treated to some wonderful tunes to keep them company in the bomb shelter. 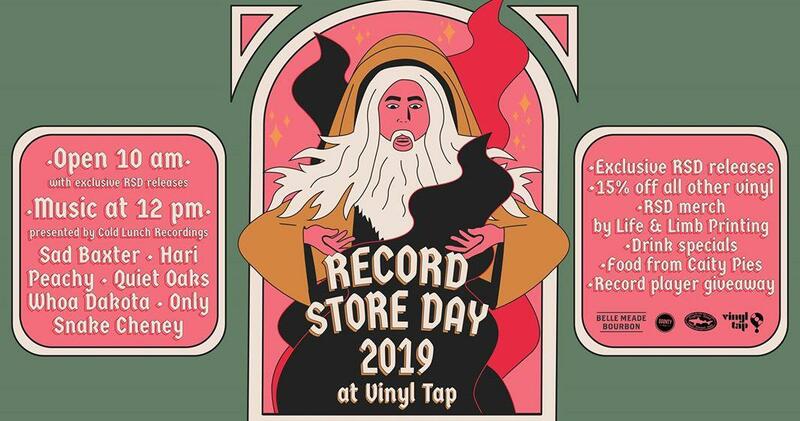 Vinyl Tap kicks its RSD celebration off at 10 a.m. with exclusive releases as well as 15 percent off all non-RSD records. Area label and promoter Cold Lunch Recordings is hosting a lineup of seven bands including Sad Baxter, Quiet Oaks, Whoa Dakota, Snake Cheney, Hari The Band, Only and Peachy. The music will go from noon to 7 p.m.
Grimey’s is set to open its doors at 9 a.m. For the first ever RSD in the new location the team is allowing the craziest of collectors to camp to the side of the store overnight for a good spot in line. They’ll have free Dogfish Head beer and musical performances from Anderson East, Alanna Royale and SUSTO beginning at 3 p.m. 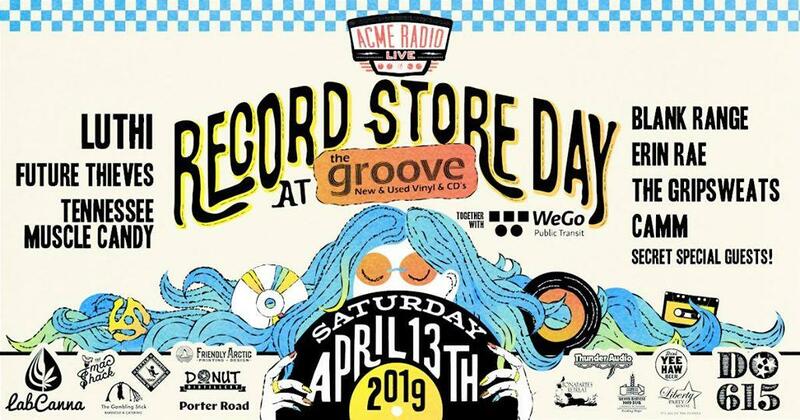 This year The Groove is partnering with ACME Radio to present a day of live music, drinks, giveaways and exclusive vinyl releases in East Nashville. Some of the artists on hand to play include Future Thieves, Blank Range, Erin Rae and LUTHI. The Groove will be opening at 9 a.m.
With some of the most unusual exclusive attractions for sale in town, Third Man Records is set to open the store at 10 a.m. on Saturday. Pick up their wild Triple Inchophone mini-turntable and play some of the label’s special 3-inch singles. Live in-store performances will be from Ornament, Dark Tea and Service. Hayden Goodridge is a student journalist on staff at WMOT.